The Band's Visit, Eran Kolirin's wonderfully droll Israeli comedy, which was unfairly disqualified from Oscar consideration last year for containing too much English, will finally open in North Carolina tomorrow in Greensboro at the Carousel Luxury Cinema. I finally saw The Band's Visit today, and it is everything it is reputed to be and then some. This beautifully modulated fish-out-of-water comedy is the kind of droll, poignant, hugely likable film that the world could use more of. Based on a true story,The Band's Visit chronicles one night in the lives of an Egyptian Police Band, who has been invited to play at an Arabic Culture Center in Israel. But instead of going to the concert's venue, they end up in a backwater town with a similar name in the middle of the desert. Stuck in a strange place with nowhere to go, the band, dressed in full uniform and carrying their instruments, are invited to stay by a beautiful restaurant owner and the quirky people who work there. Along the way, the band's uptight leader and brash newcomer are thrown together with their beautiful host, and the other musicians spend an unforgettable night in a place far from home. Kolirin establishes the offbeat tone from the very first frame, in which a van driver takes an enormous yellow ball from the back of the van and inexplicably places it in the front seat. Using static shots, long takes, and few cuts, he accentuates the awkwardness of the band and their out of place status. They are, in a sense, a relic - a reminder of a bygone era that people have forgotten. But for this one night, a minor inconvenience becomes something magical, and The Band's Visit opens up its surprising emotional wallop. For all of its dry wit and visual gags, The Band's Visit is ultimately a poignant slice of life about people from totally different backgrounds and cultures forging unexpected connections and healing old wounds. The Academy committed a grave injustice for disqualifying the film. Like Cristian Mungiu's 4 Months, 3 Weeks, and 2 Days (which was also unfairly jilted by the Academy), The Band's Visit is all about what is going on beneath the surface in any given scene. The two films may bear no other resemblance to each other (4 Months is a much grimmer film, Band's Visit is a quietly uplifting charmer), but both have the ability to say much while speaking little, and feature finely tuned performances (especially by Sasson Gabai as the band's leader, and Ronit Elkabetz as the beautiful restaurateur, who also starred in Late Marriage, another Israeli comedy that was one of my favorite films from 2002) and pitch-perfect direction. 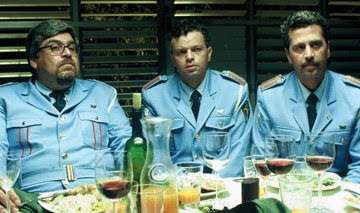 Kolirin captures the band's alienation and old-fashioned sensibilities masterfully, and the clash of cultures (old and new, Arab and Israeli) makes for one of the most heartwarming, bittersweet, and entertaining films in ages. 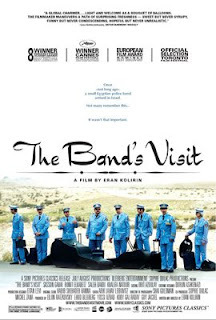 THE BAND'S VISIT; Directed by Eran Kolirin; Stars Sasson Gabai, Ronit Elkabetz, Saleh Bakri, Khalifa Natour, Shlomi Avraham; PG-13 - brief strong language; In Arabic, Hebrew, and English, w/English subtitles. Nice review of a terrific little film Matthew. It's too bad the Academy denied it because I think it's exactly the kind of movie they would've gone for. I know jealousy makes a person nasty, but when I read a glowing review like that and have not seen the film, I get sad. Almost everyone I know who has seen it loved it, including you. It must be something v. special.